Romar House’s Polynesian architecture brings the romantic South Pacific to Alabama’s beautiful beaches. Acres of lush tropical plants and palm trees create an aura of luxury unsurpassed in the area. Two eleven story towers prominently stand facing the large expanse of beach along the Gulf of Mexico. Each unit offers a spacious floor plan with three bedrooms. Each unit also features a large balcony with a direct view of the Gulf! The private beach offers generous space for family fun and frolic. Our focus is the enhancement of your family’s pleasure as you soak up the exquisite and unique Romar House atmosphere. 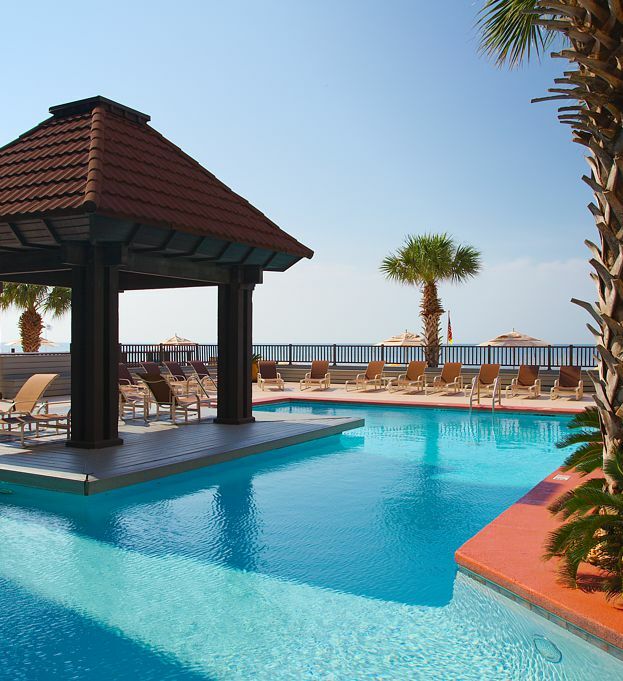 Amenities include two Gulf side pools, fitness gym, and tennis courts. The management team is available and committed to offering warm hospitality and service to Romar House guests. Romar House is within walking distance to all the great activities and local attractions. Make the most of your vacation to the beach by visiting the fun new places to play, shop and eat! A few yearly local events all within walking distance. Romar House units are 1684 square feet-consisting of 3 bedrooms and 2 baths, with a split floor plan surrounded by seven acres of lush tropical plantings. Each unit features double Gulf views from the Master Bedroom and the Living-Dining/Kitchen area. Some units will sleep 8 people, while others have sleeping accommodations for 6. Wi-Fi is furnished in all units. Units in the 01 column have a North facing Balcony in addition to the Gulf Side Balcony, where units in the 06 column have a private gated entry. Living-Dining/Kitchen areas feature large spacious fully equipped kitchens with some units featuring under the counter ice machines. Living rooms are comfortably furnished with flat screen TV's and offer direct access to the Balcony overlooking the Beautiful Gulf of Mexico. Sunrises and sunsets from here are unobstructed, which makes this the perfect place for morning coffee or late afternoon relaxing. Master Bedroom Suites provide direct Balcony access along with a large Gulf facing picture window. King-size beds are in most of the Master Bedrooms with private baths and some with beautiful walk-in showers. Separate dressing areas complete the Master Suites. The 2 North side bedrooms each have their own vanities. The large shared bathroom, and a laundry area make up the guest wing. Bedding in these two rooms vary from unit to unit, with some having king or queen beds in one and twins, bunks or combination of both in the second guest room. TV's are in each bedroom some with DVD players. Is there a grill area on the property? No, the only grills allowed on Romar House Property are electric grills. Fire code prevents the use of gas or charcoal. Do you have facilities for wedding and receptions? Small beach weddings are permitted providing the site is set up to either the east or west end of the beach. There are boardwalks at either end that allow easy access for the wedding party to the beach. Areas for reception are not available. What is the weather normally like in the area? Average year round temp runs about 55F. Summer months June - September temps can range from mid 80's to upper 90's. Perfect Beach days. Jet skis, boat, camper or trailer. Is parking available? Trailers, boats, jet skis nor campers are allowed on the property. Parking or storage of these items should be arranged for offsite with one of the several marinas or storage companies. List is available in office. Do any of the units have cribs or baby items? None of our units have baby items, Rentals of cribs, highchairs, playpens, etc, are available thru independant companies. Delivery and pickup service is offered. We are avid bicyclist and nature lovers, any good bike trails? Bike paths and nature walkways abound in the Gulf State Park, along with a fishing pier. Park has crossovers and many wooden bridges and rest stops along the way.